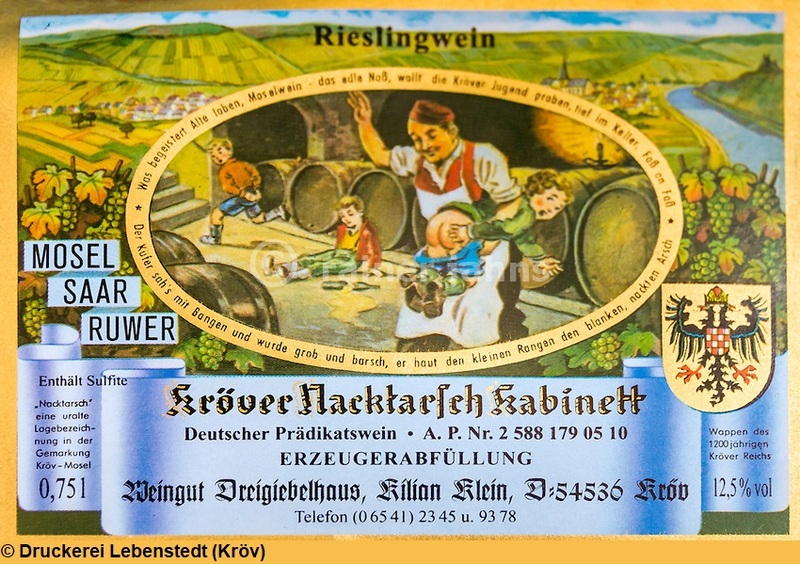 Wine description or brand wine from the German wine-growing region Moselle (Area Bernkastel), which is composed of the municipality Kröv and the Großlage Nacktarsch. The large location is divided into the individual layers Burglay, Herrenberg, Kirchlay, Letterlay, paradise and Steffensberg in the municipality Kröv; Burglay and Herrenberg are shared with the community of Kövenig. The original name is probably derived from Celtic "Nackas" meaning "rocky elevation". This refers to the fact that the slope presents itself in the fall without foliage "naked". But there are also many other and sometimes very heartfelt legends about the origin of the name. One version calls as origin the alleged similarity of the mountainside with the conscious human body part. A second version tells of a butler who spilled the bare buttocks of two boys, after he caught them while drinking from a barrel of wine. This origin story can also be found on numerous labels pictured by producers of this wine. This page was last modified at 22 June 2017 at 11:48.